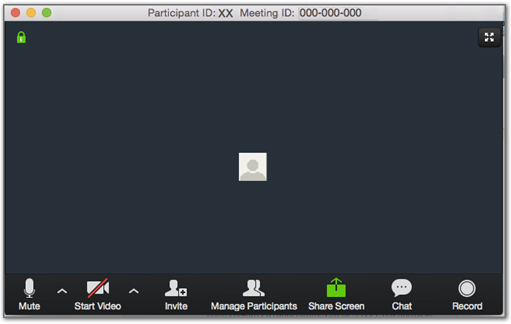 Learn how to navigate the meeting window in Zoom. Displays the video feed (or chosen icon) of whoever is currently speaking, unless Share Screen is enabled (see below). Other user feeds will be displayed at the top of the page. Mute: Control your own audio output. Start Video: Control your video output. Invite: Use this advanced option if you want to invite users other than your site participants to participate in the meeting. Share Screen: Share your full desktop or specific windows. Starting Screen Share minimizes the main meeting window and highlights the window you are sharing (if you’re sharing a window and not the desktop). You can stop sharing at any time by clicking Stop Share. Chat: Communicate with all participants or to send messages to specific participants by clicking on their name in the participants list. Record: Clicking Record starts recording for the session. Recordings are stored locally on your computer in the folder set in Settings -> Recording. Participants will not be able to record sessions without the host’s permission. If a participant does record the session, the recording will be stored locally on the participant’s computer.